I’ll start with an observation I’ve had for a couple of years now: there aren’t as many standout coffees as there once were at the London Coffee Festival. This doesn’t mean that standards have slipped or that the coffee isn’t excellent: quite the opposite, in fact. I think that people have raised their game so much that what was once outstanding four or five years ago is now commonplace, with roasters seeking out really special coffees to bring to the festival. That said, there were a few standouts this year, including some interesting new origins (coffee-growing countries for those not up with the lingo), but we’ll get onto those later. I’ll start with a round of apologies, those roasters who I either never made it to or who I only chatted to and didn’t try any coffee. The problem is that there are far too many roasters for me to get around to visiting them all, particularly since I was limited to just two days this year. While I really like the Roasters Village, which provides a relatively low-cost way for small (and not so small) roasters to exhibit, there are 16 roasters in the village alone. On top of that, there are the roasters with stands of their own, plus those appearing on the La Marzocco True Artisan Café and yet more doing pop-ups on equipment manufacturer stands. So, I apologise to everyone I didn’t get to see, particularly my friends at Lost Sheep Coffee, Allpress Espresso and Origin, who I didn’t even talk to this year! At least I got to say hello to the likes of Neighbourhood Coffee, Curve Coffee Roasters, Girls Who Grind, Union Hand-roasted and Grumpy Mule, even if I didn’t try the coffee (although in the case of Grumpy Mule, I was actually delivering coffee, a bag of Chinese Yunnan coffee, a present for Dave Jameson that I’d brought back from Sumerian Coffee in Shanghai). So, who did I actually get to see? Well, you can find out after the gallery, starting with those I’m going to call old friends, roasters I’ve known for a few years now. I started the first of my two days at the Volcano/Assembly stand, catching up with Michael and Nick, and generally chatting about coffee, which is always fun. I did, however, get things going with Volcano’s seasonal Firehouse blend, a mix of beans from India, Brazil and the Democratic Republic of Congo. It made for a great flat white in my Therma Cup. I did a similar thing on my second day, catching up with Wes, Kirby and friends at The Roasting Party, where I learnt about the latest Roasting Party coffee shop, just around the corner at Moorgate. I also tried the new blend, Elixir, also in a flat white, but this time in my HuskeeCup. Turning to filter, I said hello to Edy Piro and the rest of the Terrone & Co team, where I enjoyed a rather fruity naturally-processed Guatemalan El Bosque. I also learnt about Edy’s plans for a new café/roastery space, which sounds really exciting! More filter was to be had a Bailies, roasters of some consistently outstanding coffee. I tried all three pour-over samples, which included a naturally-processed Panama Geisha, an aerobic honey-processed Costa Rican and my favourite, a naturally-processed Guatemala El Limonar. This is a Maragogype varietal, known for its huge beans, and I was so impressed by it that I bought a bag, the only coffee I bought at the festival, destined to be a gift to a friend in San Jose. Talking of consistently roasting outstanding coffee, I popped up to see Outpost Coffee Roasters and to catch up with Harley, who bent my ear, in the nicest possible way, about the future of the coffee industry, the challenges facing coffee farmers in getting a fair price, and what roasters can do about it. While I was there, I had more filter coffee, this time a washed Kenyan Kamwangi AA, which was smooth and fruity, but less intense than a typical Kenyan. I also had an espresso, another washed coffee, this time a Burundi Kibingo, a really interesting, complex coffee which I had in my Kaffeeform cup. I ran into another old friend, Katelyn, who, along with Jason, set up ii Common, with its innovative packaging/branding, where there are just four roasts: Strong, Sweet, Bright and Complex. I tried the Complex as a pour-over (which it was) and the Sweet as an espresso (which, while fine, wasn’t that sweet). What I hadn’t realised, up until that point, is that ii Common also has a decaf, a Colombian, branded as “one less thing to keep you up at night”. One of my bugbears is how few roasters bring their decaf to coffee festivals, so naturally I was delighted, particularly as Katelyn let me have a bag, which I’ve been enjoying of an evening on my current trip to New Orleans. Talking of decaf, my friend Jess, of Weanie Beans fame, was at the festival on the Swiss Water decaf stand, so naturally I had to pop by and try some. I was particularly taken by the Ethiopian Gelgedu Edemi, which went down very well in my Global WAKEcup. So that was the old friends. But what about new coffee roasters? Well, you can see who I met for the first time after the gallery. I’ll start with Coaltown Coffee Roasters, a name I’ve known for years, but who I’ve never had the chance to meet, nor, indeed, have I had a chance to try Coaltown’s coffee. Hailing from Amonford in the South Wales valleys, Coaltown had brought its Black Gold espresso blend to the festival. A classic espresso, it was lovely, and I was so impressed that I came away with a bag for my travels. I’ve been enjoying it every morning in my Travel Press while I’ve been in New Orleans and it’s coming with me to Foster City next week as well. Another new face, and this time a new name (to me at least) was Plot Roasting from Woolwich. Several people had made Plot their top pick of the festival, so I was keen to tried out the coffee. Plot had brought along several coffees, including ones from Peru, Brazil, Tanzania and Rwanda, but I tried (at the staff’s recommendation), the Veracruz from Colombia, a coffee which had undergone an extended fermentation process, one of several new processing methods on show at the festival (you can read more about experimental processing on Plot’s website). I’ll be honest: while it was an enjoyable coffee, there wasn’t anything particularly outstanding about it (in my opinion). Staying in Europe, but turning to Berlin, I met up with Five Elephant Coffee. I’ve had Five Elephant a few times before, this time trying a washed Colombia, roasted for espresso, which made for a very fine flat white in my HuskeeCup. Staying in Berlin, I caught up with 19 Grams, although technically I shouldn’t call 19 grams a new friend, since I got to spend quite a bit of time with the team at last year’s World of Coffee in Amsterdam. As usual, there were quite a few Geishas (a rare variety of coffee) on show at the festival. Typically, Geishas are roasted for filter, with the aim of bringing out the delicate flavours. However, 19 Grams, never one to do the conventional thing, had roasted its naturally-processed Geisha from Costa Rica as an espresso. Naturally, I had to try it and it was stunning, a really intense coffee with a punchy, fruity first hit. Definitely my favourite espresso of the festival! I also attended a cupping with Christian and the team from Indo China. I first met Christian at a talk I gave on my book, The Philosophy of Coffee, last summer and we’ve stayed in touch ever since. Indo China was on the 19 Grams stand, cupping some of its coffees from China, Myanmar and the Philippines. Given that I like tasting different coffee, but try to limit how much I actually drink, I’m not sure why I don’t attend more cuppings, but this was the only one I got to. There were some interesting coffees on offer, but the one that really jumped out at me was a naturally-processed Yunnan coffee from China, a beautiful, fruity coffee that confirmed what I’d learnt from my recent trip to Shanghai: Chinese-grown coffee is coming on leaps and bounds! However, I’ve saved the best until last, with two outstanding examples, one that’s interesting because of its origin, and the other which was, hands down, the best coffee I had at the festival. You can find out more after the gallery. Yemen is, in many ways, the home of coffee. Although coffee originated in Ethiopia, Yemen was where it was first commercially cultivated and, for several centuries, Yemen was the only producer of coffee in the world. This lasted until the Dutch started large-scale coffee plantations in Indonesia in the early 18th Century, all but wiping out commercial coffee cultivation in Yemen (I go into this in more detail in my book, The Philosophy of Coffee). Although coffee continued to be grown in Yemen, it was generally not considered to be of very high quality, a situation that has only recently started to change. A big driver of this change is Mokhtar Alkhanshali, a young Yemeni American who, a few year ago, travelled to Yemen to help revive its speciality coffee industry. His story was compellingly told in Dave Eggers’ book, The Monk of Mokha, and, as a result, Yemeni coffee is now firmly back on the map. The relevance of this is that I came across Qima Coffee at the festival. 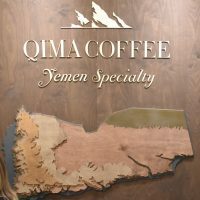 Qima is a new coffee importer/roaster, dealing exclusively in micro- and nano-lots of Yemini coffee. Qima works directly with farms in 11 different regions in Yemen, from Sa’dah in the north to Yafi in the south. Qima collects the ripe cherries twice a week, a process made far more difficult by the on-going civil war. The cherries are brought to a central plant, where the coffee is naturally processed, with an emphasis on producing high quality coffee, which is reflected in a high price tag. Much of the money goes directly back to the farmers in Yemen through higher prices for their coffee cherries, with Qima typically paying six or seven times the market price. Qima also works with them to help them improve the quality of their crops. I tried a sample of a micro-lot from Ans in the central highlands, an area known as the land of shade and waterfalls. Grown on terraced mountain sides and shady valleys at altitudes between 1,700 and 2,100 metres, I found it to be a really excellent, fruity coffee. I also managing to get a bag, which I’ve brought with me on my current trip. Talking of which, when I got home from the festival, I found another Yemini coffee waiting for me, this time from old friends Grumpy Mule. The Mule has been working with none other than Mokhtar Alkhanshali himself, the result being a UK-exclusive Port of Mokha Coffee, which I’ve also brought with me on my current trip. A complex, fruity coffee, I’ve been enjoying it using my new travelling pour-over kit while I’ve been in New Orleans and it really is outstanding. Neither the Grumpy Mule Port of Mokha nor the Qima Coffee can be described as cheap, with the price tags drawing some criticism on social media. However, bear in mind that you are buying some outstanding coffee, with much of the profit going back to farmers who are living in a war zone in Yemen. Talking of outstanding coffee, let’s turn to hands down the best coffee I had at the festival, which, coincidentally, was the last coffee I had at the festival. You can find out what it was after the gallery. Taylors of Harrogate is not necessarily a name that springs to mind when it comes to speciality coffee, but recently Taylors has been making some noise in the speciality field, building on its long-standing commitment to direct trade. This year Taylors had three filter coffees at the festival, and I tried samples of all of them. The first, New Wave, was from Ecuador, the first time Taylors has worked with farmers in the region. A washed coffee, this produced a very clean, smooth cup. The second was also a washed coffee, this time from Rwanda. Called Beautiful Tomorrow, it’s a micro-lot from the Kopakama collective of 418 women farmers. For each bag that’s sold, 100 coffee seeds will be provided to the collective’s members. Another clean, smooth cup, this one had a very pleasing sweetness to it. The third, Red Geisha is from La Negrita in Colombia. Produced using the anaerobic fermentation process, the resulting coffee is outstanding. Regular readers will know that I rarely get specific tasting notes from a coffee, but this one just screamed strawberries at me, and that was just the aroma. Tasting it was a definite “oh wow!” moment as the strawberry flavour came to the fore. Although it’s another coffee with a fairly hefty price tag, I really can’t recommend it highly enough. I came away with a new appreciation for Taylors coffee, plus a bag of the Beautiful Tomorrow and the Red Geisha to enjoy on my travels. This entry was posted in Coffee, Festivals/Awards, London by Brian Williams. Bookmark the permalink.